Microsoft to buy Nokia's mobile phone division in £4.6bn deal | What Hi-Fi? Microsoft has agreed buy Nokia's mobile phone business for €5.4bn (£4.6bn). As part of the deal, announced this morning, Nokia will also license its patents and mapping services to Microsoft. Nokia shares jumped 45 per cent on news of the deal. The deal is set to be completed in early 2014, when about 32,000 Nokia employees will transfer to Microsoft. 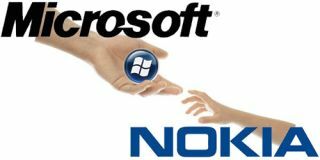 Nokia has struggled in the mobile market against tough competition from Samsung and Apple, while Microsoft has been criticised for being slow to respond to the explosive growth in smartphone and tablet sales. Last year Microsoft launched its Surface tablet, but it has had limited success. "It's a bold step into the future – a win-win for employees, shareholders and consumers of both companies," Steve Ballmer, chief executive of Microsoft, said in a statement. The sale is subject to approval by Nokia shareholders and regulators.